Recognised regional languages 68 ethnic languages and dialects. English also official in the San Andrés, Providencia and Santa Catalina Islands. a. Although the Colombian Constitution specifies Spanish (Castellano) as the official language in all its territory, other languages spoken in the country by ethnic groups (approximately 68 languages) are also official in their territories. English is also official in San Andrés, Providencia and Santa Catalina Islands. b. The official Colombian time  is controlled and coordinated by the state agency Superintendency of Industry and Commerce. Colombia ( or ; Spanish: ), officially the Republic of Colombia (Spanish: ),[Note 1] is a country situated in the northwest of South America, bordered to the northwest by Panama; to the east by Venezuela and Brazil; to the south by Ecuador and Peru; and it shares maritime limits with Costa Rica, Nicaragua, Honduras, Jamaica, Dominican Republic and Haiti. It is a unitary, constitutional republic comprising thirty-two departments. The territory of what is now Colombia was originally inhabited by indigenous peoples including the Muisca, Quimbaya, and Tairona. The Spanish arrived in 1499 and initiated a period of conquest and colonization ultimately creating the Viceroyalty of New Granada, with its capital at Bogotá. Independence from Spain was won in 1819, but by 1830 "Gran Colombia" had collapsed with the secession of Venezuela and Ecuador. What is now Colombia and Panama emerged as the Republic of New Granada. The new nation experimented with federalism as the Granadine Confederation (1858), and then the United States of Colombia (1863), before the Republic of Colombia was finally declared in 1886. Panama seceded in 1903. Since the 1960s, the country has suffered from an asymmetric low-intensity armed conflict, which escalated in the 1990s, but then decreased from 2000 onward. Colombia is ethnically diverse, its people descending from the original native inhabitants, Spanish colonists, Africans originally brought to the country as slaves, and 20th-century immigrants from Europe and the Middle East, all contributing to a diverse cultural heritage. This has also been influenced by Colombia's varied geography, and the imposing landscape of the country has resulted in the development of very strong regional identities. The majority of the urban centres are located in the highlands of the Andes mountains, but Colombian territory also encompasses Amazon rainforest, tropical grassland and both Caribbean and Pacific coastlines. Ecologically, Colombia is considered one of the world's 17 megadiverse countries, and of these, the most biodiverse per square kilometer. Colombia is a middle power with the fourth largest economy in Latin America, is part of the CIVETS group of six leading emerging markets and is an accessing member to the OECD. 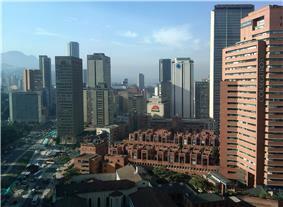 Colombia has a diversified economy with macroeconomic stability and favorable growth prospects in the long run. The name "Colombia" is derived from the last name of Christopher Columbus (Italian: Cristoforo Colombo, Spanish: Cristóbal Colón). It was conceived by the Venezuelan revolutionary Francisco de Miranda as a reference to all the New World, but especially to those under the Spanish and Portuguese rule. The name was later adopted by the Republic of Colombia of 1819, formed out of the territories of the old Viceroyalty of New Granada (modern-day Colombia, Panama, Venezuela, Ecuador, and northwest Brazil). When Venezuela and Ecuador parted ways, the Cundinamarca region that remained became a new country – the Republic of New Granada. In 1858 New Granada officially changed its name to the Granadine Confederation, then in 1863 the United States of Colombia, before finally adopting its present name – the Republic of Colombia – in 1886. To refer to this country, the Colombian government uses the terms Colombia and República de Colombia. 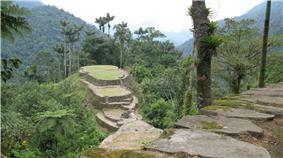 By 10,500 BCE, the territory of what is now Colombia was inhabited by aboriginal people. Nomadic hunter-gatherer tribes existed near present-day Bogotá (at El Abra and Tequendama sites) which traded with one another and with cultures living in the Magdalena River Valley. Between 5000 and 1000 BCE, hunter-gatherer tribes transitioned to agrarian societies; fixed settlements were established, and pottery appeared. Beginning in the 1st millennium BCE, groups of Amerindians including the Muisca, Quimbaya, and Tairona developed the political system of "cacicazgos" with a pyramidal structure of power headed by caciques. The Muiscas inhabited mainly the area of what is now the Departments of Boyacá and Cundinamarca high plateau (Altiplano Cundiboyacense). They farmed maize, potato, quinoa and cotton, and traded gold, emeralds, blankets, ceramic handicrafts, coca and salt with neighboring nations. The Taironas inhabited northern Colombia in the isolated Andes mountain range of Sierra Nevada de Santa Marta. The Quimbayas inhabited regions of the Cauca River Valley between the Occidental and Central cordilleras. The Incas expanded their empire on the southwest part of the country. Muisca raft. 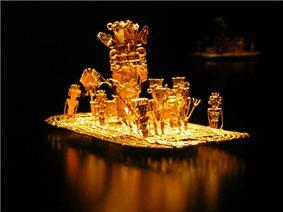 The figure refers to the ceremony of the legend of El Dorado. The legend and the gold would play a pivotal role in luring Europeans to New Granada during the 16th and 17th centuries. 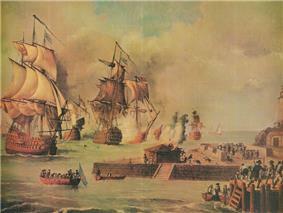 Attack of the British army commanded by Admiral Edward Vernon on Cartagena de Indias. The battle resulted in a major defeat for the British Navy and Army during the War of Jenkins' Ear, 1739–48. Santa Marta was founded in 1525, and Cartagena in 1533. Spanish conquistador Gonzalo Jiménez de Quesada led an expedition to the interior in April, 1536, and christened the districts through which he passed "New Kingdom of Granada". In August, 1538, he founded provisionally its capital near the Muisca cacicazgo of Bacatá, and named it "Santa Fe". 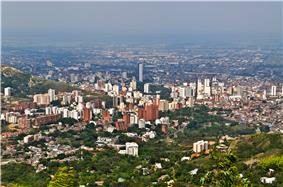 The name soon acquired a suffix and was called Santa Fe de Bogotá. Two other notable journeys by early conquistadors to the interior took place in the same period. Sebastián de Belalcázar, conqueror of Quito, traveled north and founded Cali, in 1536, and Popayán, in 1537; from 1536–1539, German conquistador Nikolaus Federmann crossed the Llanos Orientales and went over the Cordillera Oriental in a search for El Dorado, the "city of gold". The legend and the gold would play a pivotal role in luring the Spanish and other Europeans to New Granada during the 16th and 17th centuries. In 1542, the region of New Granada, along with all other Spanish possessions in South America, became part of the Viceroyalty of Peru, with its capital at Lima. In 1547, New Granada became the Captaincy-General of New Granada within the viceroyalty. In 1549, the Royal Audiencia was created by a royal decree, and New Granada was ruled by the Royal Audience of Santa Fe de Bogotá, which at that time comprised the provinces of Santa Marta, Rio de San Juan, Popayán, Guayana and Cartagena. But important decisions were taken from the colony to Spain by the Council of the Indies. Indigenous peoples in New Granada experienced a decline in population due to conquest by the Spanish as well as Eurasian diseases, such as smallpox, to which they had no immunity. With the risk that the land was deserted, the Spanish Crown sold properties to the governors, conquerors and their descendants creating large farms and possession of mines. In the 16th century, Europeans began to bring slaves from Africa. [Note 3]  To protect and exploit the indigenous peoples, several forms of land ownership and regulation were established: resguardos, encomiendas and haciendas. Repopulation was achieved by allowing colonization by farmers and their families who came from Spain. In 1717 the Viceroyalty of New Granada was originally created, and then it was temporarily removed, to finally be reestablished in 1739. The Viceroyalty had Santa Fé de Bogotá as its capital. This Viceroyalty included some other provinces of northwestern South America which had previously been under the jurisdiction of the Viceroyalties of New Spain or Peru and correspond mainly to today's Venezuela, Ecuador and Panama. So, Bogotá became one of the principal administrative centers of the Spanish possessions in the New World, along with Lima and Mexico City, though it remained somewhat backward compared to those two cities in several economic and logistical ways. The 18th-century priest, botanist and mathematician Salvador Rizo. 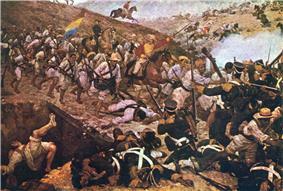 The Battle of Boyacá was the decisive battle which would ensure the success of the liberation campaign of New Granada. Since the beginning of the periods of conquest and colonization, there were several rebel movements against Spanish rule, but most were either crushed or remained too weak to change the overall situation. The last one that sought outright independence from Spain sprang up around 1810, following the independence of St. Domingue (present-day Haiti) in 1804, which provided some support to the eventual leaders of this rebellion: Simón Bolívar and Francisco de Paula Santander. A movement initiated by Antonio Nariño, who opposed Spanish centralism and led the opposition against the viceroyalty, led to the independence of Cartagena in November 1811, and the formation of two independent governments which fought a civil war – a period known as La Patria Boba. 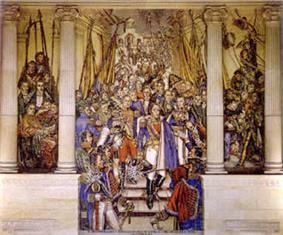 In 1811 the United Provinces of New Granada were proclaimed, headed by Camilo Torres Tenorio. Despite the successes of the rebellion, the emergence of two distinct ideological currents among the liberators (federalism and centralism) gave rise to an internal clash which contributed to the reconquest of territory by the Spanish. The viceroyalty was restored under the command of Juan Sámano, whose regime punished those who participated in the uprisings. The retribution stoked renewed rebellion, which, combined with a weakened Spain, made possible a successful rebellion led by the Venezuelan-born Simón Bolívar, who finally proclaimed independence in 1819. 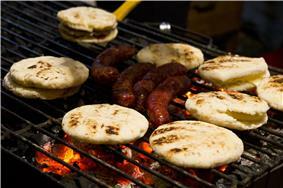 The pro-Spanish resistance was defeated in 1822 in the present territory of Colombia and in 1823 in Venezuela. The territory of the Viceroyalty of New Granada became the union of the current territories of Colombia, Panama, Ecuador, Venezuela, parts of Guyana and Brazil and north of Marañón River. The Congress of Cúcuta in 1821 adopted a constitution for the new Republic. Simón Bolívar became the first President of Colombia, and Francisco de Paula Santander was made Vice President. However, the new republic was unstable and ended with the rupture of Venezuela and Ecuador in 1830. Changes in the borders of Colombia since independence until today. Colombia was the first constitutional government in South America, and the Liberal and Conservative parties, founded in 1848 and 1849 respectively, are two of the oldest surviving political parties in the Americas. Slavery was abolished in the country in 1851. Internal political and territorial divisions led to the secession of Venezuela and Ecuador in 1830. The so-called "Department of Cundinamarca" adopted the name "Nueva Granada", which it kept until 1858 when it became the "Confederación Granadina" (Granadine Confederation). After a two-year civil war in 1863, the "United States of Colombia" was created, lasting until 1886, when the country finally became known as the Republic of Colombia. Internal divisions remained between the bipartisan political forces, occasionally igniting very bloody civil wars, the most significant being the Thousand Days' War (1899–1902). The United States of America's intentions to influence the area (especially the Panama Canal construction and control) led to the separation of the Department of Panama in 1903 and the establishment of it as a nation. The United States paid Colombia $25,000,000 in 1921, seven years after completion of the canal, for redress of President Roosevelt's role in the creation of Panama, and Colombia recognized Panama under the terms of the Thomson–Urrutia Treaty. Colombia was engulfed in the war with Peru over a territorial dispute involving the Amazonas department and its capital Leticia. ^ a b c Bushnell, David & Rex A. Hudson (2010) "The Society and Its Environment"; Colombia: a country study: pp. 87, 92. Washingtion D.C.: Federal Research Division, Library of Congress. ^ Uribe, Jaime Jaramillo. "Perfil histórico de Bogotá." Historia crítica 1 (1989): 1. ^ Ramírez, Natalia, and Germán Gutiérrez. "Félix de Azara: Observaciones conductuales en su viaje por el Virreinato del Río de la Plata." Revista de historia de la psicología 31.4 (2010): 52–53. ^ McFarlane, Anthony. "El colapso de la autoridad española y la génesis de la independencia en la Nueva Granada." Desarrollo y Sociedad 7 (1982): 99-120. 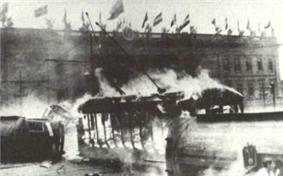 ^ On 9 April 1948, Gaitán was assassinated outside his law offices in downtown Bogotá. The assassination marked the start of a decade of bloodshed, called La Violencia (the violence), which took the lives of an estimated 180,000 Colombians before it subsided in 1958. ^ The country has improved its political climate, public debate, in all manner of things including obviously in the subject of human rights: Human Rights Watch. colombiareports.co (12 October 2011). ^ Colombia lidera Consejo de Seguridad de ONU en medio de crisis árabe – Política en Colombia y el Mundo. Eltiempo.Com (2 April 2011). Retrieved 14 May 2012. ^ DE TIERRA, LOMBRICES. Patrón de distribución y listado de especies de las lombrices de tierra (Annelida, Oligochaeta) en Colombia. 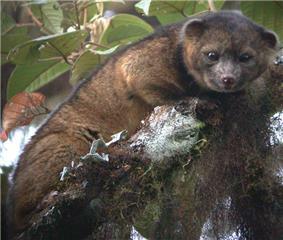 Acta Zoologica Mexicana (ns), 2004, vol. 20, no 2, p. 197. ^ "Colombia – Population". Library of Congress Country Studies. ^ Bushnell & Hudson, pp. 87–88. ^ Llegaron los venezolanos. Semana.com. Retrieved 4 June 2011. ^ IPA transcription of "República de Colombia": . ^ Balboa is best known for being the first European to see the Pacific Ocean in 1513, which he called Mar del Sur (or "Sea of the South") and would facilitate Spanish exploration and settlement of South America. ^ A royal decree of 1713 approved the legality of Palenque de San Basilio founded by runaway slaves. From the mid-16th century, slaves had fled and sought refuge in the jungles of the Caribbean coast. The Spanish forces could not tolerate them and ended up submitting, thereby giving rise to the first free place in the Americas. 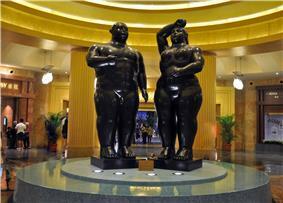 Its main leader was Benkos Biohó, born in the region Bioho, Guinea Bissau, West Africa. 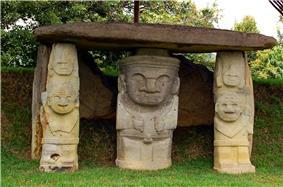 Palenque de San Basilio was declared in 2005 as a "Masterpiece of Oral and Intangible Heritage of Humanity" by UNESCO. Public spending on education as a proportion of gross domestic product in 2013 was 4.9%. This represented 16.9% of total government expenditure. The primary and secondary gross enrolment ratios stood at 114.9% and 93% respectively. School-life expectancy was 13.5 years. A total of 93.6% of the population aged 15 and older were recorded as literate, including 98.2% of those aged 15–24. Bachilleres (high-school graduates) may enter into a professional undergraduate career program offered by a university; these programs last up to five years (or less for technical, technological and intermediate professional education, and post-graduate studies), even as much to six to seven years for some careers, such as medicine. In Colombia, there is not an institution such as college; students go directly into a career program at a university or any other educational institution to obtain a professional, technical or technological title. Once graduated from the university, people are granted a (professional, technical or technological) diploma and licensed (if required) to practice the career they have chosen. For some professional career programs, students are required to take the Saber-Pro test, in their final year of undergraduate academic education. After the successful completion of all the basic and middle education years, a high-school diploma is awarded. The high-school graduate is known as a bachiller, because secondary basic school and middle education are traditionally considered together as a unit called bachillerato (sixth to eleventh grade). Students in their final year of middle education take the ICFES test (now renamed Saber 11) in order to gain access to higher education (Educación superior). This higher education includes undergraduate professional studies, technical, technological and intermediate professional education, and post-graduate studies. Technical professional institutions of Higher Education are also opened to students holder of a qualification in Arts and Business. This qualification is usually awarded by the SENA after a two years curriculum. The educational experience of many Colombian children begins with attendance at a preschool academy until age five (Educación preescolar). Basic education (Educación básica) is compulsory by law. It has two stages: Primary basic education (Educación básica primaria) which goes from first to fifth grade – children from six to ten years old, and Secondary basic education (Educación básica secundaria), which goes from sixth to ninth grade. Basic education is followed by Middle vocational education (Educación media vocacional) that comprises the tenth and eleventh grades. It may have different vocational training modalities or specialties (academic, technical, business, and so on.) according to the curriculum adopted by each school. A study conducted by América Economía magazine ranked 20 Colombian health care institutions among the top 42 in Latin America, amounting to 48 percent of the total. Through health tourism, many people from over the world travel from their places of residence to other countries in search of medical treatment and the attractions in the countries visited. Colombia is projected as one of Latin America’s main destinations in terms of health tourism due to the quality of its health care professionals, a good number of institutions devoted to health, and an immense inventory of natural and architectural sites. Cities such as Bogotá, Cali and Medellín are the most visited in cardiology procedures, neurology, dental treatments, stem cell therapy, ENT, ophthalmology and joint replacements among others for the medical services of high quality. Life expectancy at birth in 2000 was 74 years; the life expectancy increased to 78 years by 2012. Health standards in Colombia have improved very much since the 1980s, healthcare reforms have led to the massive improvements in the healthcare systems of the country. Although this new system has widened population coverage by the social and health security system from 21% (pre-1993) to 96% in 2012, health disparities persist, with the poor continuing to suffer less attention in their medical procedures. Boxing is one of the sports that more world champions has produced for Colombia. Motorsports also occupies an important place in the sporting preferences of Colombians; Juan Pablo Montoya is a race car driver known for winning 7 Formula One events. Colombia also has excelled in sports such as taekwondo, shooting sport, wrestling, judo, bowling, athletics and has a long tradition in weightlifting. In baseball, another sport rooted in the Caribbean Coast, Colombia was world amateur champion in 1947 and 1965. Baseball is popular in the Caribbean, mainly in the cities Cartagena, Barranquilla and Santa Marta. Of those cities have come good players like: Orlando Cabrera, Edgar Rentería who was champion of the World Series in 1997 and 2010, and others who have played in Major League Baseball. Colombia is a mecca for roller skaters. The national team is a perennial powerhouse at the World Roller Speed Skating Championships. Colombia has traditionally been very good in cycling and a large number of Colombian cyclists have triumphed in major competitions of cycling. Tejo is Colombia’s national sport and is a team sport that involves launching projectiles to hit a target. But of all sports in Colombia, football is the most popular. Colombia was the champion of the 2001 Copa América, in which they set a new record of being undefeated, conceding no goals and winning each match. Interestingly, Colombia has been awarded “mover of the year” twice. James Rodríguez, Colombian football player. Although the Colombian cinema is young as an industry, more recently the film industry was growing with support from the Film Act passed in 2003. Some important national circulation newspapers are El Tiempo and El Espectador. Television in Colombia has two privately owned TV networks and three state-owned TV networks with national coverage, as well as six regional TV networks and dozens of local TV stations. Private channels, RCN and Caracol are the highest-rated. The regional channels and regional newspapers cover a department or more and its content is made in these particular areas. 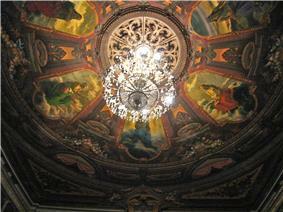 The Ibero-American Theater Festival of Bogotá is one of the biggest theater festivals in the world. In general, Colombian music blends European-influenced guitar and song structure with large gaita flutes and percussion instruments from the indigenous population, while its percussion structure and dance forms come from Africa. Colombian music reflects a wealth of musical influences that have given birth to a dynamic musical environment. Some of the most popular music genres that have marked the Colombian music with special relevance are the cumbia, vallenato, joropo, salsa, bambuco, rock, pop and the classical music. Shakira and Juanes are two of the most well-known Colombian musicians internationally. Colombian music is promoted mainly by the support of the largest record labels, independent companies and the Government of Colombia, through the Ministry of Culture. Photography in Colombia began with the arrival in the country of the Daguerreotype that was brought by the Baron Gros in 1841. The Piloto public library has Latin America’s largest archive of negatives, containing 1.7 million antique photographs covering Colombia 1848 until 2005. The Colombian sculpture from the sixteenth to 18th centuries was mostly devoted to religious depictions of ecclesiastic art, strongly influenced by the Spanish schools of sacred sculpture. During the early period of the Colombian republic, the national artists were focused in the production of sculptural portraits of politicians and public figures, in a plain neoclassicist trend. During the 20th century, the Colombian sculpture began to develop a bold and innovative work with the aim of reaching a better understanding of national sensitivity. The earliest examples of gold craftsmanship have been attributed to the Tumaco people  of the Pacific coast and date to around 325 BCE. Roughly between 200 BCE and 800 CE, the San Agustín culture, masters of stonecutting, entered its “classical period". They erected raised ceremonial centres, sarcophagi, and large stone monoliths depicting anthropomorphic and zoomorphhic forms out of stone. Colombian art has over 3,000 years of history. Colombian artists have captured the country's changing political and cultural backdrop using a range of styles and mediums. There is archeological evidence of ceramics being produced earlier in Colombia than anywhere else in the Americas, dating as early as 3,000 BCE. Vargas Swamp Lancers. Artwork Rodrigo Arenas Betancourt. Between 1939 and 1940 seven books of poetry were published under the name Stone and Sky in the city of Bogotá that significantly impacted the country; they were edited by the poet Jorge Rojas. In the following decade, Gonzalo Arango founded the movement of "nothingness" in response to the violence of the time; he was influenced by nihilism, existentialism, and the thought of another great Colombian writer: Fernando González Ochoa. During the boom in Latin American literature, successful writers emerged, led by Nobel laureate Gabriel García Márquez and his magnum opus, One Hundred Years of Solitude, Eduardo Caballero Calderón, Manuel Mejía Vallejo, and Álvaro Mutis, a writer who was awarded the Cervantes Prize and the Prince of Asturias Award for Letters. Other leading contemporary authors are Fernando Vallejo (Rómulo Gallegos Prize) and Germán Castro Caycedo, the best-selling writer in Colombia after García Márquez. Post-independence literature linked to Romanticism highlighted Rafael Pombo (the latter of whom wrote notable works of children's literature). Within that period, authors such as José Asunción Silva, José Eustasio Rivera, León de Greiff, Porfirio Barba-Jacob and José María Vargas Vila developed the modernist movement. In 1872, Colombia established the Colombian Academy of Language, the first Spanish language academy in the Americas. Candelario Obeso wrote the groundbreaking Cantos Populares de mi Tierra (1877), the first book of poetry by an Afro-Colombian author. Colombian literature dates back to pre-Columbian era; a notable example of the period is the epic poem known as the Legend of Yurupary. In Spanish colonial times notable writers include Hernando Domínguez Camargo and his epic poem to San Ignacio de Loyola, Juan Rodríguez Freyle (The Sheep)  and the nun Francisca Josefa de Castillo, representative of mysticism. Jorge Isaacs was one of the greatest exponents of Colombian literature in nineteenth century. 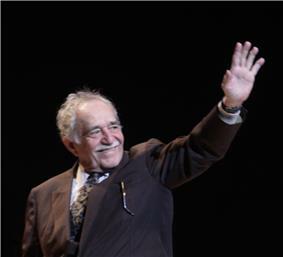 The Nobel literature prize winner, Gabriel García Márquez. Many national symbols, both objects and themes, have arisen from Colombia's diverse cultural traditions and aim to represent what Colombia, and the Colombian people, have in common. Cultural expressions in Colombia are promoted by the government through the Ministry of Culture. Colombia lies at the crossroads of Latin America and the broader American continent, and as such has been hit by a wide range of cultural influences. Native American, Spanish and other European, African, American, Caribbean, and Middle Eastern influences, as well as other Latin American cultural influences, are all present in Colombia's modern culture. Urban migration, industrialization, globalization, and other political, social and economic changes have also left an impression. The National Administrative Department of Statistics (DANE) does not collect religious statistics, and accurate reports are difficult to obtain. However, based on various studies and a survey, about 90% of the population adheres to Christianity, the majority of which (70.9%) are Roman Catholic, while a significant minority (16.7%) adhere to Protestantism (primarily Evangelicalism). Some 4.7% of the population is atheist or agnostic, while 3.5% claim to believe in God but do not follow a specific religion. 1.8% of Colombians adhere to Jehovah's Witnesses and Adventism and less than 1% adhere to other religions, such as Islam, Judaism, Buddhism, Mormonism, Hinduism, Indigenous religions, Hare Krishna movement, Rastafari movement, Orthodox Catholic Church, and spiritual studies. The remaining people either did not respond or replied that they did not know. In addition to the above statistics, 35.9% of Colombians reported that they did not practice their faith actively. Many immigrant communities have settled on the Caribbean coast, in particular recent immigrants from the Middle East. 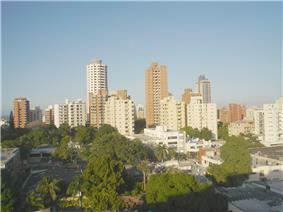 Barranquilla (the largest city of the Colombian Caribbean) and other Caribbean cities have the largest populations of Lebanese, Palestinian, and other Arabs. There are also important communities of Chinese, Japanese, Romanis and Jews. There is a major migration trend of Venezuelans, due to the political and economic situation in Venezuela. Black Africans were brought as slaves, mostly to the coastal lowlands, beginning early in the 16th century and continuing into the 19th century. Large Afro-Colombian communities are found today on the Caribbean and Pacific coasts. The population of the department of Chocó, running along the northern portion of Colombia's Pacific coast, is over 80% black. British and Jamaicans migrated mainly to the islands of San Andres and Providencia. A number of other Europeans and North Americans migrated to the country in the late 19th and early 20th centuries, including people from the former USSR during and after the Second World War. Many of the Indigenous peoples experienced a reduction in population during the Spanish rule  and many others were absorbed into the mestizo population, but the remainder currently represents over eighty distinct cultures. Reserves (resguardos) established for indigenous peoples occupy 30,571,640 hectares (305,716.4 km2) (27% of the country's total) and are inhabited by more than 800,000 people. Some of the largest indigenous groups are the Wayuu, the Paez, the Pastos, the Emberá and the Zenú. The departments of La Guajira, Cauca, Nariño, Córdoba and Sucre have the largest indigenous populations. The 2005 census reported that the "non-ethnic population", consisting of whites and mestizos (those of mixed white European and Amerindian ancestry), constituted 86% of the national population. 10.6% is of African ancestry. Indigenous Amerindians comprise 3.4% of the population. 0.01% of the population are Roma. An extraofficial estimate considers that the 49% of the Colombian population is Mestizo or of mixed European and Amerindian ancestry, and that approximately 37% is White, mainly of Spanish lineage, but there is also a large population of Middle East descent; among the upper class there is a considerable input of Italian and German ancestry. People with African ancestry in Colombia are concentrated mostly in coastal areas. Amerindian population of Colombia by municipality in 2005. Including Spanish, a total of 101 languages are listed for Colombia in the Ethnologue database. The specific number of spoken languages varies slightly since some authors consider as different languages what others consider are varieties or dialects of the same language. The best estimates recorded that 70 languages are spoken in the country today. Most of these belong to the Chibchan, Tucanoan, Bora–Witoto, Guajiboan, Arawakan, Cariban, Barbacoan, and Saliban language families. There are currently about 850,000 speakers of native languages. More than 99.2% of Colombians speak Spanish, also called Castilian; 65 Amerindian languages, two Creole languages and the Romani language are also spoken in the country. English has official status in the archipelago of San Andrés, Providencia and Santa Catalina. The life expectancy is 78 years in 2012 and infant mortality is 15 per thousand in 2013. In 2013, 93.6% of adults and 98.2% of youth are literate and the government spends about 4.9% of its GDP in education. The population is concentrated in the Andean highlands and along the Caribbean coast. The nine eastern lowland departments, comprising about 54% of Colombia's area, have less than 3% of the population and a density of less than one person per square kilometer (two persons per square mile). Traditionally a rural society, movement to urban areas was very heavy in the mid-20th century, and Colombia is now one of the most urbanized countries in Latin America. The urban population increased from 31% of the total in 1938 to 60% in 1975, and by 2014 the figure stood at 76%. 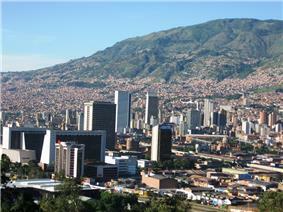 The population of Bogotá alone has increased from just over 300,000 in 1938 to approximately 8 million today. In total seventy one cities now have populations of 100,000 or more (2013). As of 2012 Colombia has the world's largest populations of internally displaced persons (IDPs), estimated to be up to 4.9 million people. With an estimated 48 million people in 2015, Colombia is the third-most populous country in Latin America, after Brazil and Mexico. It is also home to the third-largest number of Spanish speakers in the world after Mexico and the United States. At the beginning of the 20th century, Colombia's population was approximately 4 million. The population increased at an annual rate of 1.9% between 1975 and 2005, but its rate of growth is projected to drop to 1.2% over the next decade. Colombia is projected to have a population of 50.9 million by 2020. These trends are reflected in the country's age profile. In 2005 over 30% of the population was under 15 years old, compared to just 5.1% aged 65 and over. Transportation in Colombia is regulated within the functions of the Ministry of Transport  and entities such as the National Roads Institute (INVÍAS) responsible for the Highways in Colombia (13,000 km), the Aerocivil, responsible for civil aviation and airports, the National Infrastructure Agency, in charge of concessions through public–private partnerships, for the design, construction, maintenance, operation, and administration of the transport infrastructure, the General Maritime Directorate (Dimar) has the responsibility of coordinating maritime traffic control along with the Colombian Navy, among others and under the supervision of the Superintendency of Ports and Transport. Some leading Colombian scientists are Joseph M. Tohme, researcher recognized for his work on the genetic diversity of food, Manuel Elkin Patarroyo who is known for his groundbreaking work on synthetic vaccines for malaria, Francisco Lopera who discovered the "Paisa Mutation" or a type of early-onset Alzheimer's, Rodolfo Llinás known for his study of the intrinsic neurons properties and the theory of a syndrome that had changed the way of understanding the functioning of the brain, Jairo Quiroga Puello recognized for his studies on the characterization of synthetic substances which can be used to fight fungus, tumors, tuberculosis and even some viruses and Ángela Restrepo who established accurate diagnoses and treatments to combat the effects of a disease caused by the Paracoccidioides brasiliensis, among other scientists. Important inventions related to the heart failure. Also invented in Colombia were the microkeratome and keratomileusis technique, which form the fundamental basis of what now is known as LASIK (one of the most important techniques for the correction of refractive errors of vision) and the Hakim valve for the treatment of Hydrocephalus, among others. Colombia has begun to innovate in military technology for its army and other armies of the world; especially in the design and creation of personal ballistic protection products, military robots, simulators and radar. 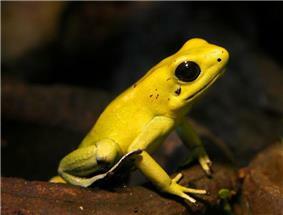 Colombia has more than 5,500 research groups in science and technology. iNNpulsa, a government body that promotes entrepreneurship and innovation in the country, provides grants to startups, in addition to other services it and institutions like Apps.co provide. Co-working spaces have arisen to serve as communities for startups large and small. Organizations such as the Corporation for biological research for the support of young people interested in scientific work has been successfully developed in Colombia. The International Center for Tropical Agriculture based in Colombia investigates the increasing challenge of global warming and food security. Tourism in Colombia is an important sector in the country's economy. Foreign tourist visits were predicted to have risen from 0.6 million in 2007 to 2.5 million in 2014. The financial sector has grown favorably due to good liquidity in the economy, the growth of credit and in general to the positive performance of the Colombian economy. The Colombian Stock Exchange through the Latin American Integrated Market (MILA) offers a regional market to trade equities. Colombia is now one of only three economies with a perfect score on the strength of legal rights index, according to the World Bank. The electricity production in Colombia comes mainly from renewable energy sources. 67.8% is obtained from the hydroelectric generation. Colombia's commitment to renewable energy was recognized in the 2014 Global Green Economy Index (GGEI), ranking among the top 10 nations in the world in terms of greening efficiency sectors. Colombia is also known as an important global source of emeralds, while over 70% of cut flowers imported by the United States are Colombian. Non-traditional exports have boosted the growth of Colombian foreign sales as well as the diversification of destinations of export thanks to new free trade agreements. Principal trading partners are the United States, China, the European Union and some Latin American countries. El Cerrejón is the largest coal mining operation in Latin America. Total government expenditures account for 28.3 percent of the domestic economy. Public debt equals 32 percent of gross domestic product. A strong fiscal climate was reaffirmed by a boost in bond ratings. Annual inflation closed 2014 at 3.66% YoY (vs. 1.94% YoY in 2013). The average national unemployment rate in 2014 was 9.1%, although the informality is the biggest problem facing the labour market (the income of formal workers climbed 24.8% in 5 years while labor incomes of informal workers rose only 9%). Colombia has Free trade Zone (FTZ), such as Zona Franca del Pacifico, located in the Valle del Cauca, one of the most striking areas for foreign investment. Colombia's market economy grew steadily in the latter part of the 20th century, with gross domestic product (GDP) increasing at an average rate of over 4% per year between 1970 and 1998. The country suffered a recession in 1999 (the first full year of negative growth since the Great Depression), and the recovery from that recession was long and painful. However, in recent years growth has been impressive, reaching 6.9% in 2007, one of the highest rates of growth in Latin America. According to International Monetary Fund estimates, in 2012 Colombia's GDP (PPP) was US$500 billion (28th in the world and third in South America). Historically an agrarian economy, Colombia urbanised rapidly in the 20th century, by the end of which just 17% of the workforce were employed in agriculture, generating just 6.1% of GDP; 21% of the workforce were employed in industry and 62% in services, responsible for 37.3% and 56.6% of GDP respectively. 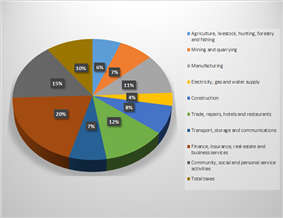 Colombia's gross domestic product by sector for the second half of the year 2015. Click on a department on the map below to go to its article. The National Army is formed by divisions, brigades, special brigades and special units; the Colombian Navy by the Naval Infantry, the Naval Force of the Caribbean, the Naval Force of the Pacific, the Naval Force of the South, the Naval Force of the East, Colombia Coast Guards, Naval Aviation and the Specific Command of San Andres y Providencia; and the Air Force by 15 air units. The National Police has a presence in all municipalities. The Colombian military is divided into three branches: the National Army of Colombia; the Colombian Air Force; and the Colombian Navy. The National Police functions as a gendarmerie, operating independently from the military as the law enforcement agency for the entire country. Each of these operates with their own intelligence apparatus separate from the national intelligence agency (ANIC, in Spanish). The executive branch of government is responsible for managing the defense of Colombia, with the President commander-in-chief of the armed forces. The Ministry of Defence exercises day-to-day control of the military and the Colombian National Police. Colombia has 466,713 active military personnel. And in 2013 3.4% of the country's GDP went towards military expenditure, placing it 18th in the world. Colombia's armed forces are the largest in Latin America, and it is the second largest spender on its military after Brazil. Colombia was one of the 4 founding members of the Union of South American Nations and the Andean Community of Nations. The foreign affairs of Colombia are headed by the President, as head of state, and managed by the Minister of Foreign Affairs. Colombia has diplomatic missions in all continents. 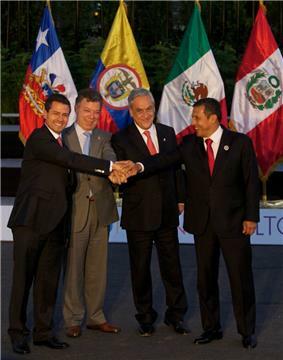 The VI Summit of the Pacific Alliance: President of Colombia, Juan Manuel Santos is second from the left. Despite a number of controversies, the democratic security policy has ensured that former President Uribe remained popular among Colombian people, with his approval rating peaking at 76%, according to a poll in 2009. However, having served two terms, he was constitutionally barred from seeking re-election in 2010. In the run-off elections on 20 June 2010 the former Minister of defense Juan Manuel Santos won with 69% of the vote against the second most popular candidate, Antanas Mockus. A second round was required since no candidate received over the 50% winning threshold of votes. Santos won nearly 51% of the vote in second-round elections on 15 June 2014, beating right-wing rival Óscar Iván Zuluaga, who won 45%. His term as Colombia's president runs for four years beginning 7 August 2014. 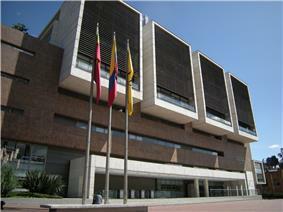 The judicial branch is headed by four high courts, consisting of the Supreme Court which deals with penal and civil matters, the Council of State, which has special responsibility for administrative law and also provides legal advice to the executive, the Constitutional Court, responsible for assuring the integrity of the Colombian constitution, and the Superior Council of Judicature, responsible for auditing the judicial branch. Colombia operates a system of civil law, which since 2005 has been applied through an adversarial system. The legislative branch of government is represented nationally by the Congress, a bicameral institution comprising a 166-seat Chamber of Representatives and a 102-seat Senate. The Senate is elected nationally and the Chamber of Representatives is elected in electoral districts. Members of both houses are elected to serve four-year terms two months before the president, also by popular vote. 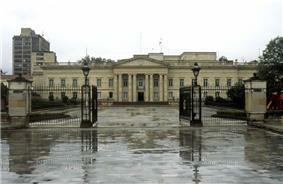 Casa de Nariño, is the official home and principal workplace of the President of Colombia. In the tierra fría mean temperatures range between 12 and 17 °C (53.6 and 62.6 °F). Beyond the tierra fría lie the alpine conditions of the forested zone and then the treeless grasslands of the páramos. Above 4,000 meters (13,123 ft), where temperatures are below freezing, is the tierra helada, a zone of permanent snow and ice. Colombians customarily describe their country in terms of the climatic zones. Below 1,000 meters (3,281 ft) in elevation is the tierra caliente (hot land), where temperatures are above 24 °C (75.2 °F). About 82.5% of the country's total area lies in the tierra caliente. Protected areas and the "National Park System" cover an area of about 14,254,147.24 hectares (142,541.4724 km2) and account for 12.75% of the Colombian territory. 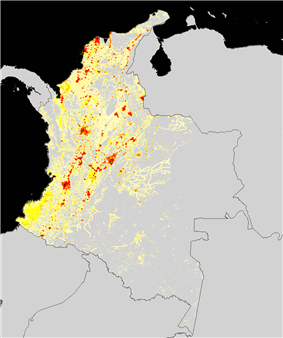 Compared to neighboring countries, rates of deforestation in Colombia are still relatively low. Colombia is the sixth country in the world by magnitude of total renewable freshwater supply, and still has large reserves of freshwater. East of the Andes lies the savanna of the Llanos, part of the Orinoco River basin, and, in the far south east, the jungle of the Amazon rainforest. Together these lowlands comprise over half Colombia's territory, but they contain less than 3% of the population. To the north the Caribbean coast, home to 20% of the population and the location of the major port cities of Barranquilla and Cartagena, generally consists of low-lying plains, but it also contains the Sierra Nevada de Santa Marta mountain range, which includes the country's tallest peaks (Pico Cristóbal Colón and Pico Simón Bolívar), and the La Guajira Desert. By contrast the narrow and discontinuous Pacific coastal lowlands, backed by the Serranía de Baudó mountains, are sparsely populated and covered in dense vegetation. 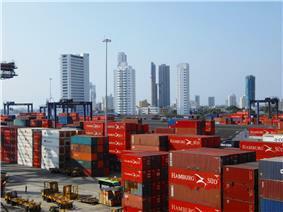 The principal Pacific port is Buenaventura. Part of the Ring of Fire, a region of the world subject to earthquakes and volcanic eruptions, Colombia is dominated by the Andes (which contain the majority of the country's urban centres). Beyond the Colombian Massif (in the south-western departments of Cauca and Nariño) these are divided into three branches known as cordilleras (mountain ranges): the Cordillera Occidental, running adjacent to the Pacific coast and including the city of Cali; the Cordillera Central, running between the Cauca and Magdalena River valleys (to the west and east respectively) and including the cities of Medellín, Manizales, Pereira and Armenia; and the Cordillera Oriental, extending north east to the Guajira Peninsula and including Bogotá, Bucaramanga and Cúcuta. In 2014, the National Administrative Department of Statistics (DANE) reported that 28.5% of the population were living below the poverty line, of which 8.1% in "extreme poverty". 784,000 people have been lifted out of poverty. The Government has also been developing a process of financial inclusion within the country's most vulnerable population. Today Colombia is the third largest oil producer in South America and at the end of 2012 it was estimated Colombia was producing a million barrels a day. Colombia shows modest progress in the struggle to defend human rights, as expressed by HRW. In terms of international relations, Colombia has moved from a period of tension and animosity with Venezuela, towards a positive outlook and a spirit of cooperation. Colombia has also won a seat on the Security Council of the UN. The Peace process in Colombia, 2012 refers to the dialogue between the Colombian government and guerrilla of FARC-EP with the aim to find a political solution to the armed conflict. The Colombian government and rebel groups meet in Cuba. As of September 2015, the talks have led to significant breakthroughs. 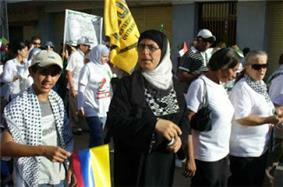 The Government also began a process of assistance and reparation for victims of conflict. 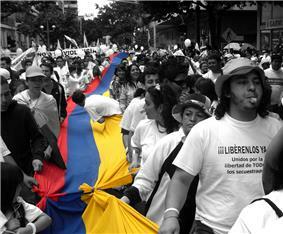 In February 2008, millions of Colombians demonstrated against FARC. 26,648 FARC and ELN fighters have decided to demobilize since 2002. During these years the military forces of the Republic of Colombia managed to be strengthened. During the presidency of Álvaro Uribe, the government applied more military pressure on the FARC and other outlawed groups. After the offensive, many security indicators improved. Since 2002 the violence has decreased significantly, with some paramilitary groups demobilizing as part of a controversial peace process. As a result, the guerrillas lost control of much of the territory they had once dominated. Colombia achieved a great decrease in cocaine production, leading White House drug czar R. Gil Kerlikowske to announce that Colombia is no longer the world's biggest producer of cocaine. Demonstration against the intimidation and attacks by the FARC and the ELN on Colombian citizens. On 4 July 1991, a new Constitution was promulgated. The changes generated by the new constitution are viewed as positive by Colombian society. The United States has been heavily involved in the conflict since its beginnings, when in the early 1960s the U.S. government encouraged the Colombian military to attack leftist militias in rural Colombia. This was part of the U.S. fight against communism. Since the 1960s, the country has suffered from an asymmetric low-intensity armed conflict between the government forces, left-wing guerrilla groups and right-wing paramilitaries. The conflict escalated in the 1990s. The conflict in Colombia takes place mainly in remote rural areas or marginalized sectors of very difficult access. After Rojas' deposition, the Colombian Conservative Party and Colombian Liberal Party agreed to create the "National Front", a coalition which would jointly govern the country. Under the deal, the presidency would alternate between conservatives and liberals every 4 years for 16 years; the two parties would have parity in all other elective offices. The National Front ended "La Violencia", and National Front administrations attempted to institute far-reaching social and economic reforms in cooperation with the Alliance for Progress. In the end, the contradictions between each successive Liberal and Conservative administration made the results decidedly mixed. Despite the progress in certain sectors, many social and political problems continued, and guerrilla groups were formally created such as the FARC, ELN, EPL, MAQL and M-19 to fight the government and political apparatus. From 1953 to 1964 the violence between the two political parties decreased first when Gustavo Rojas deposed the President of Colombia in a coup d'état and negotiated with the guerrillas, and then under the military junta of General Gabriel París Gordillo. Map of the Old Baldy area where Colombian troops fought during the Korean War. Colombia entered the Korean War when Laureano Gómez was elected as President. It was the only Latin American country to join the war in a direct military role as an ally of the United States. Particularly important was the heroic resistance of the Colombian troops at Old Baldy.